The Leather Protection Warranty For Furniture Purchases $0-$750 by Dunk & Bright at Dunk & Bright Furniture in the Syracuse, Utica, Binghamton area. Product availability may vary. Contact us for the most current availability on this product. Leather upholstery is not just beautiful, but is also an extremely durable furniture covering. With basic care and maintenance, it can look great for years - even with daily use. 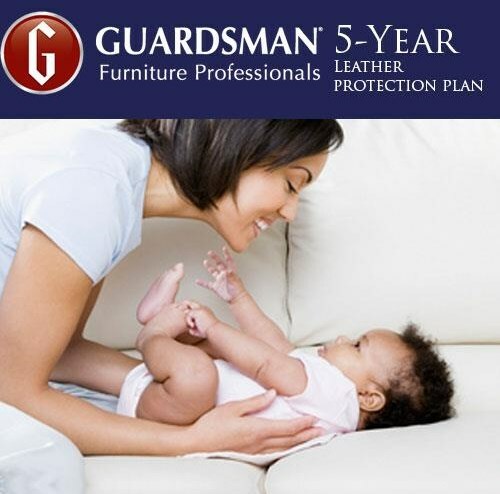 Ensure your new leather furniture is protected against accidental stains and damage for years to come with Guardsman's Leather Complete Furniture Protection Plan, then sit back and enjoy the comfort of having one less thing to worry about. *All plans are subject to limitations and exclusions. Ask your sales associate to review a sample of the Leather Complete Furniture Protection Plan before purchasing. Don’t forget. Keep all your furniture looking its best with Guardsman’s line of premium performing furniture care products. The Leather Protection collection is a great option if you are looking for Equipment in the Syracuse, Utica, Binghamton area. Browse other items in the Leather Protection collection from Dunk & Bright Furniture in the Syracuse, Utica, Binghamton area.